EXCITING NEW RESEARCH IN AUTOIMMUNE DISEASES AND OTHER DEGENERATIVE CONDITIONS: THE WORLD'S FIRST REPORTED AND FORMALLY DIAGNOSED SUCCESSFUL RECOVERIES FROM AUTOIMMUNE CHRON' S DISEASE! Since the first administration of the CFIDS Protocol in 1994 it was observed that many patients with CFIDS and secondary auto-immune conditions such as Ulcerative collitis, Chron's disease and also patients with HIV have responded very well to the CFIDS Protocol and reported successful reversal of both CFIDS and secondary auto-immune problems. There is a similarity of genetic make up in CFIDS and patients with above auto-immune gastro-intestinal conditions as well. Helen Power is a registered nurse from Johannesburg who had Chron's disease for many years. She was also put on cortisone that she took for many years without any significant clinical effects on progression status of her autoimmune condition. Eventually she developed CFIDS as well. Helen responded very well to the CFIDS Protocol and reported not only successful reversal of her Chronic Fatigue Syndrome but also complete elimination of all lesions associated with Chron's disease! This remarkable recovery was documented by endoscopic imaging and her internist's report. Helen Power's exciting case history also constitutes the first clinically documented successful reversal of Chron's disease in the world. Dramatic improvements were reported by HIV patients as well. This is very interesting taking into account numerous immunological similarities in HIV and CFIDS patients and warrants further research in therapeutical administration of antioxidants in HIV patients. Successful reversal of Chron's disease on the CFIDS Protocol as confirmed via endoscopic imaging. TIMING Examination (elective routine). It is a diagnostic procedure. CLINICAL Chronic diarrhoea, Crohns surveillance and. BOWEL PREPARATION With Kleen-prep (PEG). Quality: clear liquids: excellent exclusion value. COLON Normal. Evidence of previous surgery: ileo-colonic anastomosis. ACTION POST Can be discharged. Colonososcopy report froni Dr Teichert (attached). Dr Wolovitz - Rosebank Clinic Friday 10 October (3rd opinion) I took the x rays reports and blood test results with me. After getting my medical history, looking at tha results. etc. he asked if he could keep everything to discuss with some of his colleagues and radiologists. He says it is evident that the liver has narrowing of the ducts but it is important that they establish whether the inter hepatic ducts are involved or just the main ducts. He will contact me next week re diagnosis. My blood pressure has been very low - lower thar usual It was 86/60. Started another programme. You mentioned that, with more information, you wou be able to focus on the problem areas for the second month and it would ot be as intensive as last time. I wait to hear from you. I first came to see you in January 1997 - over 9 years ago! At that time I was physically, mentally and emotionally exhausted. I had been ill with gastro-intestinal problems since 1972 I had been married for only 4 years, with one child and pregnant with the second. My condition was finally diagnossed as Crohn's Disease - an auto-immune problem, late in 1979 by Prof. J A Myburg who was head of the Department of Surgery at the Johannesburg Hospital. When I met you I had finally come to the place, after 25 difficult years, where I could no longer continue putting on a brave face and struggling on with no reserves to draw from. You understood my situation, giving me hope for the first time in a long while. You explained why much of the previous approach to my illness had helped ease the symptoms but notprovided lasting improvement. We've walked a long road together since then, which has live a healthy, fulfilling, energetic life. Thank-you seems so inadequate for so great a benefit! Any interested people can read my previous testimonial written back in August 1997. Then, it had taken only 6 months for me to experience a remarkable improvement! Unfortunately, because of the extensive bowel resections I had undergone, I struggled with many nutritional deficiencies due to mal-absorption. I have needed ongoing supplements to sustain the progress. The specialists I had been consulting and told me that I would need vitamin injections for the rest of my life because most of my terminal ileum and colon had been removed. Within weeks of starting your programme my body was absorbing the vitamins and I stopped having injections. That was a huge relief - after 5 years of weekly jabs! At first progress was slow but it was steady. I was able to come off all the heavy immuno-suppressive and anti-inflammatory medication I had been on. For a long time now I have only had medication for hypothyroid, hormonal replacement therapy and slowing bowel motility. From mid 1997 to early 2003 I was generally very well. I was main on your maintenance programme, with variations here and there, for that whole period. One exception was the few weeks in 200 when I had an acute Cholecystitis that necessitated emergency hospital admission and investigation. We agreed that I should have conservative treatment. The episode passed. In February 2003 I had acute Chlecystitis that again necessitated emergency hospitalization. Unfortunately my GP, Dr Marietta Witthuhn, was operating that afternoon when I presented with acute with abdominal pain, nausea and vomiting. Her receptionist advised me to go to Nite Doc ar Medgate. From there I was referred to Flora Clinic. The next five weeks were very traumatic for me. I was admitted to Flora Clinic as an emergency and seen by Dr Pawlak, a specialist surgeon on call. I had x-rays, MRI scan, Endoscopic Retrograde Choloe-Pancreatogram (ERDP) x2 (unsuccessful due to failure to enter the biliarytract because of oedema at the duodema). He suspected cancer of the pancreatic duct although a blood test did not give any indication of it. I was ssent to Dr Duncan ( Lifestyle Intervention unit at Unitas hospital, Pretoria) for biliary Catheterization ( catheter placement Choloductus). I was told it was just as small a small procedure under local anaesthetic-" like a mosquito bite". After the procedure (I DID get a general anaesthetic) I had 16 punture marks on my right side. A Percutaneous Cholanglogram revealed multiple stricturing of the common bile duct Tintra-Hepatic duct in keeping with a chronic Cholangitis. I was returned, with catheter in Situ, by ambulance to Flora Clinic for a 3rd ERCP and Sphincterotomy the following day. About 40 small stones -black bile salts, were removed from gall bladder. I was discharged two days later after Dr Pawlak recommended I have my gall bladder removed. It seems to me that, if he advised surgery initially, most of thr above - and what followed, would have been unnecessary. My husband and I went away for a weekend to recuperate. Most of that time I wsa very weak. I experienced an increase abdominal ache. When I returned on the Tuesday I consulted my GP who examined me and phoned a different Specialist Surgeon, Dr Teichert,to see me urgently for a second opinion. I was admitted to Wilgeheuwel Hospital. Dr Teichert conferred what Physician & Rheumatologist), regarding the complexities of Crohn's Disease and 2 days later I went to theatre for surgery. The gall bladder was removed. There was has been abdominal bleeding from the attempts at biliary catheterization in the ducts after the sphincterotomy. Post-op complications resilted in bre.. stay in ICU and re-admission for an infected wound. Throughout my stay appreciated the fact that Dr Treichert and Dr Pettipher consulted with eachother their areas of expertise to give their best attention. It took many months fo rme to regain my health, Following the above episode my liver enzymes kept increasing - until August 2003, when Dr Teichert referred me to Dr Deon de Vos (Gastro-enterologist/Physician) at Flora clinic. He did another ERCP to check that there were no remaining stones blocking the common bile duct. He reported a mid stenotic area at the confluence of the intrahepatic and common hepatic ducts where there was evidence of 'beading'. In order to rule out malignant cholangitis, a blood test CA199 was done - the result was negative. He made the diagnosis of Sclerosing Cholangitis as a complication of Crohns Disease. This was confirmed in November 2003 by your colleague, Dr Alan Wolowitz (Specialist Surgeon at Rosebank Clinic) when I asked him for a second opinion. The question the doctors were asking was whether the Crohn's Disease was active although I was relatively well. In October 2003 Dr Teichert did a Colonoscopy to check this out. Normal healthy tissueas far as the remaining terminal ileum was seen. There was evidence of previous surgery (ileo-colonic anastamosis) but no trace of scarring from inflammatory episodes since that time. The full colour report was an amazing confirmation that your protocol had reversed the disease process- not just halted it. We had great cause to celebrate! In May 2004 my liver enzymes were showing alarming results: alk.phos.488 (29-.... 255 (5-40 U/L 37'C); ALT 90 (10-32 U/L 37'C); AST 79 (10-32 U/L 37'C)-norms in ( ). Dr de Vos said these results were due to liver damage, that I needed to have 6 monthly liver function tests and a liver scan and keep all the results in a file as I might need a liver transplant in the future.He explained that there was no proven treatment to reverse the damage. As I was healthy apart from the liver problem, he agreed that I should continue with your protocol. At this point you did a lot of research about liver function, even contacting Prof Maurizio-Parola in Turino, Italy, who is a world expert in the field of chronic liver disease.We really appreciate your efforts in an area that was not your usual field of expertise, so you could give me a protocol that might process. I started taking it in August 2004. The results improves over the next 20 months. One concern recently has been a comment on the liver scan report in March 2006 suggesting that there is fatty infiltration of the liver, In April, in order to address this issue, you again made some changes to the protocol. I have now been on it for two months. I am swallowing a large number of capsules and tablets every day, paying attention to a high protein intake and keeping a steady weight of 59 kgs ( about 15 Kgs more than I used to weigh - I am 1.7 metres tall.) The latest liver function test (done on 26/06/06) is very encouraging when compared with the May 2004 results - Alk.phos 206; Gamma GT 77. Alt 36. Ast 34 , I have not yet had another liver scan to check whether the fatty infiltration has decreased. God bless you as you continue to look for answers for suffering humanity. I pray for the day when your research will be taken seriously by the whole medical profession. Exciting Diagnostic Report and Futuristic Therapeutical Results :The Australian Centre for Digestive Diseases formally confirms full reversal of autoimmune Chron's disease in a patient on Dr Petrovic's CFIDS Protocol. J ason White is also the second patient in the world who completely recovered from Chron's disease. Helen Power, a registered nurse from Johannesburg (RSA) is the first patient in the world whose complete reversal of Chron's disease on the CFIDS Protocol was completely documented as per above comprehensive endoscopic and health status reports. She has been in a complete remission since her recovery as well. 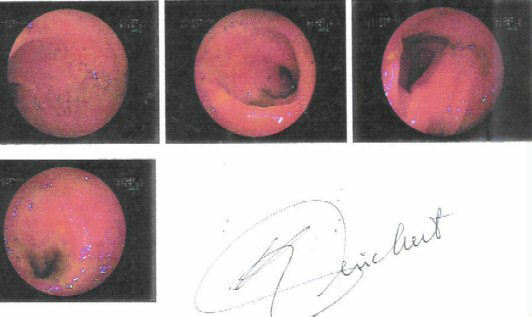 In September 2009, endoscopic examination confirmed very successful and complete reversal of Chron's disease on the CFIDS Protocol in J. Coetzee, student from Durban who suffered from both CFIDS and Chron's disease. Above 3 patients, i.e. Jason White ( Australia), Helen Power (RSA) and J. Coetzee (RSA) are also the only patients in the world who completely recovered from their Chron's disease! The fact that all above patients had CFIDS i.e primary medical condition that was heavily complicated with autoimmune Chron's disease confirms that Chronic Fatigue Immunodysfunction Syndrome can form a favourable biochemical disposition for the development of secondary, super-imposed autoimmune problems. These exciting case studies reflect powerful immunomodulatory properties of the CFIDS Protocol and warrant further in-depth medical research for the benefit of patients suffering from autoimmune entities as well. UK -LIFESCAN Clinic Report January 2006 - Impressive evidence that the CFIDS Protocol prevented formation of arteriosclerotic plaque in a former CFIDS patient with a history of diabetes of 20 years!